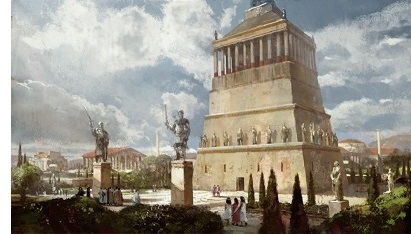 Mausoleum at Halicarnassus - An Ancient Wonder of the world, the Mausoleum at Halicarnassus was built as the final resting place of King Mausolus and his wife (and sister) Artemesia II of Caria. Halicarnassus was a Greek colony in Asia Minor that was part of the Persian Empire at the time of the mausoleum's construction between 353 and 350 B.C.. Mausolus was the satrap of Caria (basically a Persian governor), and the word for the tomb comes from his name. It stood 148 ft (45m) in height and incorporated architecture from the three primary cultures in the region. The base was Lycian, the upper level was Greek and the roof was Egyptian. The mausoleum survived into the Middle Ages when it was heavily damaged by an earthquake in 1304. It was ultimately plundered for its stone by the Knights Hospitallers in 1494 to build a fort after they invaded the region.